Booking your stay with Vagabond Inn has never been easier and more reliable. 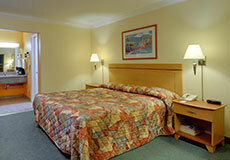 Backed by the latest technology, you are able to see real time room availability. This feature prevents any possibility of overbookings or unclear reservations. All information entered online is safely encrypted with SSL certificates to ensure your personal data is secure. Once you've booked your reservation, you may print your reservation confirmation for your records, but you will also receive your confirmation via email. This ensures there is no confusion or uncertainties with your reservation. Easily manage, change or even cancel your reservations online simply by logging into your account. Changes are made instantly with no hassle or waiting for the "next available operator". Online contact forms are also made available to you for group bookings, guest feedback or general comments. With modern technology leading the way, we are able to focus on making your stay with us a memorable one.